The three members of the BiH Presidency, Milorad Dodik, Željko Komšić and Šefik Džaferović, met on Tuesday afternoon in Brussels with Federica Mogherini, High Representative for Foreign Affairs and Security Policy/Vice-President of the European Commission, during their first joint visit abroad since the Presidency was inaugurated in November last year. In response to their common message of commitment to the country’s European Union integration path, the High Representative welcomed their resolve to work together, stressing that their unity of action will be to the benefit of Bosnia and Herzegovina and all of its citizens. In this respect, the role of the Presidency in lowering political tensions and promoting reconciliation will be crucial. “The High Representative and the Presidency members agreed on the importance of seeing the country’s Council of Ministers and all entity governments formed without delay, so that they can address the many challenges that lie ahead. Among them are the rule of law, including the electoral reform, implementation of Constitutional Court decisions and strengthening of judiciary, as well as continued social-economic reforms”, says the EU in a press release. Equally, it was noted that Bosnia and Herzegovina needs to submit swiftly all the replies to the questionnaire for the European Commission to finalise its opinion on the country’s EU membership application. 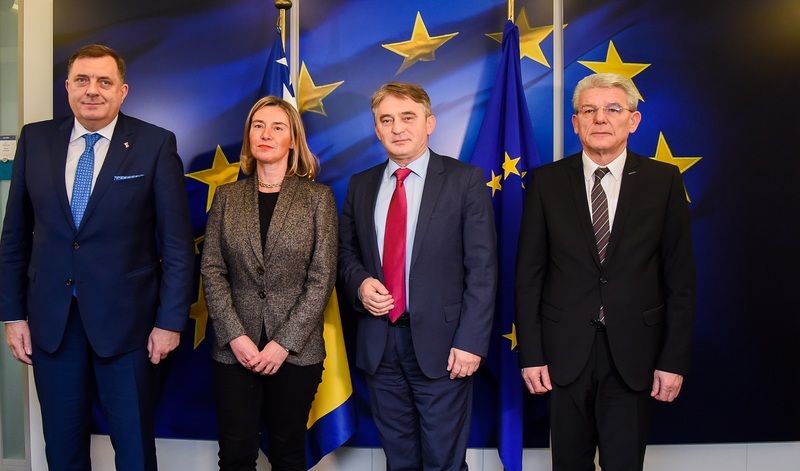 Mogherini highlighted her commitment to the EU perspective of the country and stressed that she wants to see irreversible progress of Bosnia and Herzegovina and the Western Balkans region towards the EU by the end of the year. Presidency Chairman, Milorad Dodik (Serb), said after the meeting that two key issues for BiH were reiterated in Brussels – the EU Questionnaire and the formation of the government. Dodik described the meeting as good and successful, regardless of the overall situation in BiH. “There is consensus with regard to the European path. We are late with the questionnaire, procedures, but there was an opportunity to inform that everything was agreed about the answers, that the translations procedure is ongoing and that it would be over in 20-30 days. EU Parliament will issue an opinion on BiH – which will close the procedure for possible candidate status”, Dodik said. He said that by November 1, BiH would try to receive a candidate status, and that on the meeting there was discussion about the formation of the government in BiH. BiH Presidency member, Željko Komšić (Croat), said after the meetings that this visit by members of the BiH Presidency is “an encouragement”. “We talked about forming the government, as well as other issues. We will see what will happen at the next meetings with the members of the European Commission and the European Union, and then we will formulate a complete opinion”, a member of the BiH Presidency said. Presidency member Šefik Džaferović (Bosniak), highlighted as important Mogherini’s message that the Western Balkans is at the top of the European Union’s priorities. For him, it is “impressive” that the European Union is determined to make institutional connections with the countries of the Western Balkans. “This year, the mandate of the European Commission by November 1 will be used by countries to make a step forward towards the European Union. There is no doubt that the European Commission wants Bosnia and Herzegovina to get candidate status no later than November 1 this year”, he said. Džaferović reminded that the candidate for Council of Ministers Chairman must be a person who respects the Constitution and the laws of Bosnia and Herzegovina.